We are living in an opportunistic era. And taking up a worthy opportunity is the smartest thing to do, especially now, when good openings are rare amidst the cut-throat competition. But any offer that comes your way can’t be all good. There are so many dimensions to cover before you bid adieu to your current employer. I don’t think changing jobs is as simple and unharming as it seems, especially to the freshers in the industry. As per my experience in the HR field, the employees who really need a guiding light on ‘When is the right time to leave?’ are either the ones who are job hopping, changing workplaces every year, or the ones who have become so comfortable at their organization that changing seems like a nightmare to them. So, ideally, how long should you stay at any organization to have grasped everything it had to offer? And is it really the right time to leave? According to me, the completion of the 5th year at any organization should be the deciding year. Anyone quitting before that and anyone not quitting after that must consider the following aspects to make the right decision. 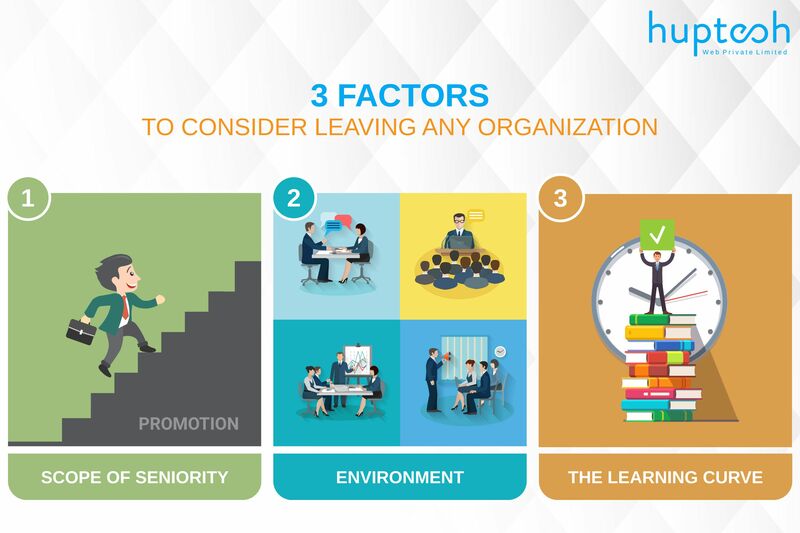 If you have not yet completed 5 years at your current organization, you must analyze your scope of getting priority for a managing position in future. A general rule of allotting managing positions is to consider loyalty and if you are good at your job, there’s a chance that you might be crowned for your seniority. You must think long-term especially if there’s no real reason for you to quit. It has been observed in the hiring industry that people who continue their jobs at the same organization for more than 5 years have low hiring rate. They are considered to be less enthusiastic unless they are rising there according to their seniority. Are you? If you have been working at the same organization for more than 5 years, you should be moving forward for your professional image. If you are not, it’s time to look for options. It is completely natural to leave your current job if you are not satisfied with the work culture. But if you don’t have any complaints against the environment or are actually loving it, don’t resign before thinking it through. It is genuinely rare to find an organization with compassion, friendliness, authenticity, and integrity as core principles. Especially if your management is approachable, I wouldn’t recommend anyone to go for the change if everything’s well. How respectful are your juniors towards you? Has anything changed in these 5 years which makes you uncomfortable? A lot of fresh minds will arrive at the organization. So, if you decide on staying after 5 years, you must be mentally ready to stay updated and have more conviction for yourself. Along with seniority comes a responsibility of steering the responses of the people towards you. Learning is a constant process. However, it does come to a pause in an organization where people, responsibilities, and positions don’t change. But, is one or two years of time enough to judge that? Absolutely not. As an HR manager, I could tell you this, we judge the dependability factor of a candidate by the number of his work years and nothing looks as bad as short-lived association with the previous organizations. So, as long as you have something to adapt to, learn something, it is better to clear your differences with the management rather than switching jobs. Ask your peers for new roles and responsibilities if you feel exhaustive. People have stayed loyal to their organizations to have bagged the title of CEOs, so it all comes to you. There’s always something to learn regardless of the years if your colleagues, management, and the organization are the right kind. So if you feel that you are still developing and are being assigned to new roles and responsibilities which will only take you closer to your pursuit, only then you should continue the association. In all, there is a lot to weigh before you quit. Abrupt decisions might become a huge setback in your career which could take years to slide back on the right track. At Huptech, we always welcome the new members with open arms but when it comes to letting our employees go, we make sure we weren’t the source of any discomfort. After all, it is our motto to grow in unison! coverage! Keep up the amazing works guys I’ve included you guys to blogroll. How Can Google Shopping Make You An E-Commerce Giant? Why is Digital Marketing a spectacular choice for marketers?